Pundits and politicos have been exercising themselves for years, if not decades, to account for the emergence of the formerly silent majority—the broad coalition of white southerners, northern white ethnics, exurban fundamentalists, libertarians, ethnic Catholics, and guns-rights and anti-abortion folks who helped install a conservative hegemony in the US since at least the Reagan era. The very phenomenon of the Reagan Democrats—those blue-collar, ethnically self-identified folk who one might have thought would vote Democratic but went for Reagan and his epigones—seemed to cement the wisdom of the young Kevin Phillips, who predicted in 1969, in The Emerging Republican Majority, a southern-tinged resurgence of conservatism and a decisive rightward shift among those formerly considered stalwarts of the old Democratic coalition. For all the self-congratulation, hope, and anxiety that Obama’s election has inspired for those left-of-center (or even middle-of-center, or even sentient), there remains a lurking incredulity: how did those guys get away with it for all those years? And is this country really so polarized? The shallow yet not insignificant popularity of Sarah Palin suggested that a red-meat-eating, gun-toting, moose-killing, Russki-hating, America-First-ing sensibility still lingered in the republic, and that a slice of the voting population would hail its representative, shiny, fertile, well-dressed and well–coiffed as she was. Allan J. Lichtman’s White Protestant Nation asks us to take a longer, more complicated view. He locates the rise of the American conservative movement not in the McCarthyite paranoias of the ‘50s; not in the counter-counter-cultural thrust of those disgusted with hippies, liberals, and radicals in the late ‘60s and early ‘70s; but rather in the 1920s—that infamous decade more usually taken up as “the Jazz Age,” but which a long cold look might also render “The Klan Age.” Lichtman’s history is deeply researched yet lucidly and even spiritedly written: he takes us on an assured tour of the country in its many modes—the status of Prohibition; the upsurge of the Klan; the weaving of religious recoil with intellectual dismay at the ascendancy of godless relativists. Lichtman is writing in a field often and well-trod; it is a measure of his authority that his book, while touching on old-familiars, weaves a dense cultural and political history into something accessible, rich, and strange. Litchtman is particularly strong in sorting out ideological currents from political contingencies. He shows us how the American conservative movement is not, in fact, homologous with libertarianism: one fascinating thread in the book is the tension between these strains, not least in the improbable career of Barry Goldwater. Lichtman is especially good at identifying what he calls the “anti-pluralist” strain of American thought: it is this—not states’ rights, not limited government, not the Second Amendment—that unites a recognizable conservative movement in the US from the 1920s onward. I think Lichtman is right, and that any future historian will have to debate him most intensively if he or she wishes to shift the terrain. Lichtman reads American conservatism as a kind of ethnic nationalism—something we are perhaps more prepared to recognize in other new nations, anxious to consolidate their identity. Conservatives, as Lichtman identifies them, completely reject pluralism, ethnic, religious, or otherwise. The Klan, in its apogee, was completely establishment, as ordinary as your local grocer and the Methodist church, relying on identification as white protestants, implicitly defined against Catholics, Jews, and of course, Negroes. One of the fascinating shifts in twentieth-century conservatism is the growing accommodation with Catholics: William F. Buckley’s National Review factors large in this account, perhaps too large, as the ideological brains of the operation in the ‘60s and beyond. But Lichtman’s account of a hypertrophied identitarian cultural politics of “white” “protestant” “nationalists” is wholly persuasive. He has tracked a whole mode of cultural patriotism alien to the more cosmopolitan and assimilationist projects of such progressive thinkers as Randolph Bourne (see his amazing essay, “Transnational America”). Lichtman is especially good at challenging and even debunking received wisdom, though he doesn’t set out (only) to do so. He identifies a “Southern strategy” as early as the 1920s; argues contra David Brooks that American conservatism was always radical, always a root-and-branch outfit and not an outpost of measured Burkean traditionalism. Thus conservatives looked askance not only at Gerald Ford, the hapless golfing-accidental president, but at Nixon and Reagan himself, as well as George W. Bush. Eisenhower was another slippery character, as far as conservatives saw it. Lichtman argues, moreover, that American conservatism is as much a phenomenon of modernity as liberalism (or progressivism or what have you); we’d be very stupid to accept standard conservative rhetoric celebrating traditionalism as the actual explanatory historical or ideological narrative of the movement. You can’t go home again, or at least, you can’t go home to the eighteenth-century again. But you can always go back to ethnic nationalism, in the US as elsewhere, and Lichtman has made a strong case that that’s what American conservatives have been doing for almost one hundred years. I write here in a borderline ideological key Lichtman himself scrupulously avoids; he addresses twentieth-century American conservatism as a deeply serious, humanly significant phenomenon to be analyzed seriously, without contempt and without prejudgment. For those looking for actual historical nuance, Lichtman will be highly illuminating. Polemicists of all stripes are encouraged to leave their weapons and preconceptions at the door. Yet one can’t help but see that polemicists of a progressive stripe will find much here to stoke their fires: there’s been a long antipluralist racialist—if not outright racist—strand in mainstream American politics for a long while, and it remains to be seen whether contemporary debates about immigration, welfare, asylum, etc. will escape the discourse all too firmly established by decades of white protestant nationalism masquerading as the self-evident order of universal justice and good. 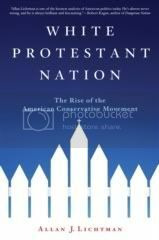 "2008 Nonfiction Finalist White Protestant Nation, by Allan J. Lichtman" was posted February 13, 2009.